Oh I do love tea. Sometimes, a cup of tea is all I need to unwind and relax after a long day. A time to put away the mobile, have a good cup of tea and perhaps some snacks along with it too. 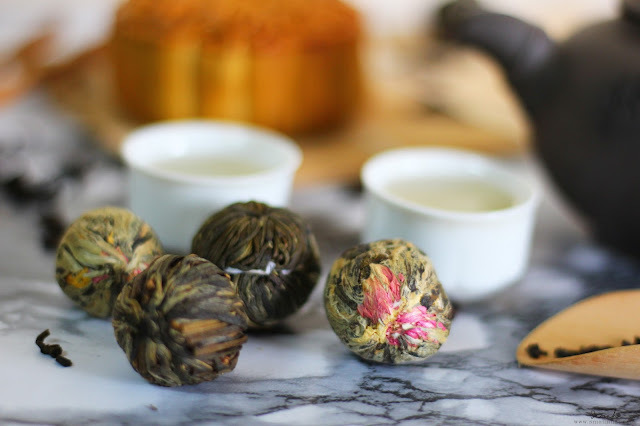 There's a lot of different kinds of tea available like loose tea leaves, tea bags, white tea, black tea, green tea and the list goes on.. We're basically spoilt for choice but if you are looking for something more fancier than the typical loose tea leaves or tea bags, then I would recommend the Tea Balls from Tea Life Asia. It's "blooming-ly" interesting and pretty. 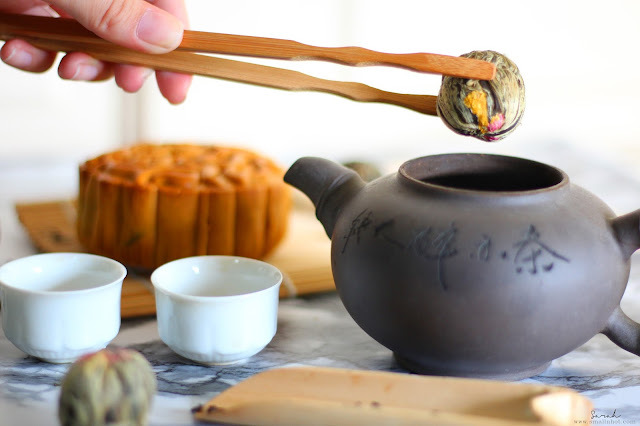 I have to admit, this is not the best looking tea balls but trust me when you pour in your hot water, this ball of tea will bloom into a beautiful looking flower. Exquisite display of spring needle white and green tea leaves woven into a bouquet of Globe Amaranth, Marigold and Jasmine flowers. 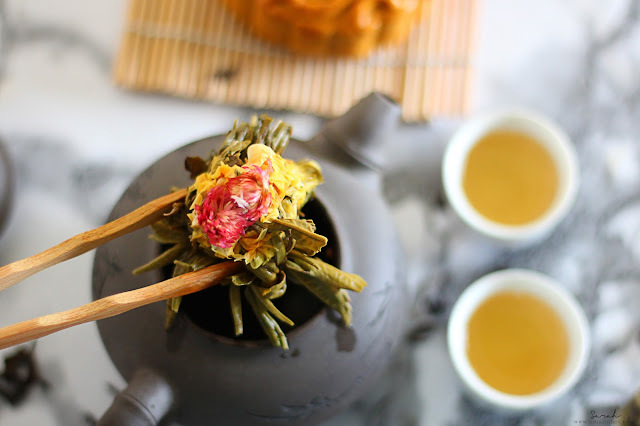 Every sip of this lovely Double Happiness Blooming Tea is like taking a step into the cosy garden by a country house. With a book and a cup of tea, I could easily spend the whole day lounging in the house. I can seriously taste the refreshing flowery flavour in the tea. If you do enjoy a cup of flowery tea then I would highly recommend this. 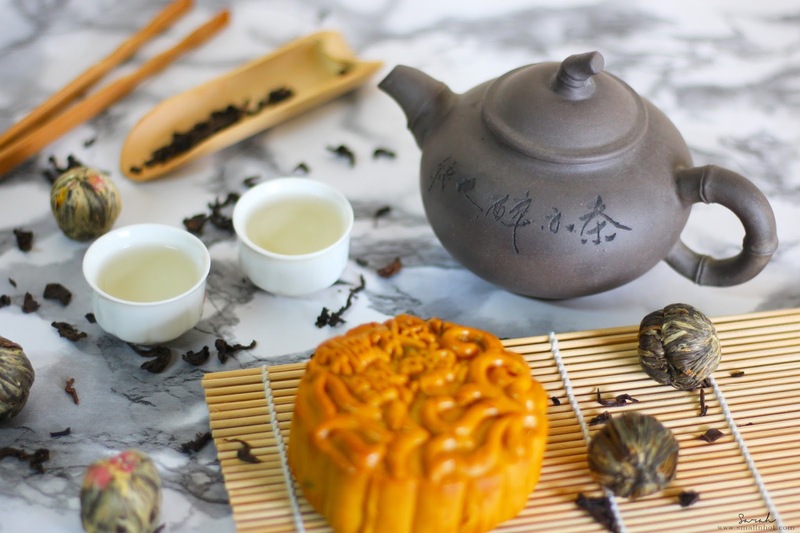 My only advice is to pour in more water when you are having the blooming tea because the first brew is slightly too concentrated for my liking, but as you drink, the heavy flavours will fade away, leaving a subtle flowery flavour to savor. Elegant spring needle white and green tea leaves are handcrafted into a bouquet of Jasmine and Golden Marigold flowers. If you want a less floral flavoured tea option from Blooming Tea, then this is the one to get. 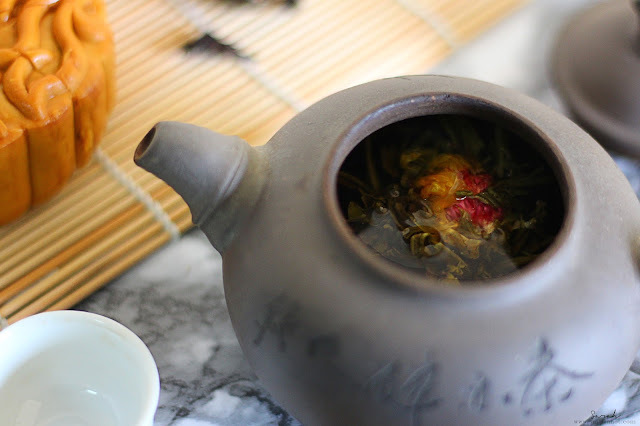 The Oriental Beauty Blooming Tea has a more of a chinese-tea-like flavour with a touch of flowery aroma to it. I had this tea with a slice of mooncake and it was a perfect match, for the simple fact that the herby flavoured tea complements the sweetness from the mooncake.